As I already said before, Ignis Innovation's SID booth was one of the conference highlights for me. Their technology is very impressive and hopefully will enable cheaper non-LTPS AMOLED production. In their booth, Ignis were showing 3.5" and 20" AMOLED panels that use the company's a-Si backplane compensation technology. The panels were made by RiTdisplay. 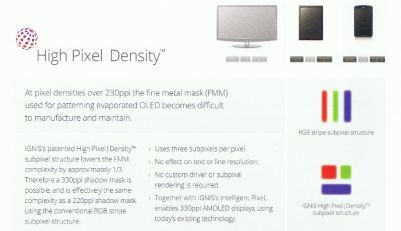 Ignis and RiTdisplay have been showing these displays back in 2011. Originally they were supposed to be released towards the end of 2011, but this never happened. During SID Ignis announced that now the plan is to release these by the end of 2012. According to Ignis the 3.5" AMOLED will be cheaper than the LTPS-based competition (i.e. Samsung made panels). You can read more about these panels and RiTdisplay's plans at my RiTdisplay-at-SID-2012 post. The 20" panels had lot's of defects, but Ignis says it's just from bad bonding and the new batch they should receive soon will not have those defects. Their technology can be used to manufacture any panel size with resolution up to 2k x 4k and up to 240Hz, and besides the defects, the displays looked really good (the 3.5" panels also looked great) and were very thin (see below). Ignis' basic technology, which enables a-Si to be used as a backplane for AMOLED displays uses both internal and external compensation. Internal compensation means compensation for backplane issues (a-Si uniformity and stability issues). The external compensating deals with AMOLED burn-in. The idea is to keep track of how much each pixel was used. This way they know by how much it is less bright than a pixel that hasn't been used before. They use this information to drive other pixels up to compensate. Ignis calls this the Max Life technology. While it theoretically makes the "eventual" lifetime (until the display burns out completely) worse, in practice it helps to make the device last longer and avoid burn-in. Ignis says that the main problem is non-uniformity in brightness (i.e. when certain areas of the screen are noticeably less bright than other areas) and not actual brightness. Ignis were also showing monochrome AMOLEDs with high resolution. I don't have any technical details, but the idea is to provide quality monochrome (black and white) high resolution for medical applications (and other similar markets). I can just say that those displays looked very sharp indeed. Another interesting technology that Ignis is promoting is their High Pixel technology. This is a patented subpixel structure that can lower FMM complexity by about a third, allowing 330 ppi with shadow mask. Ignis is also working on other technologies, and also provides drivers for LTPS and Oxide-TFT backplanes. Like I said at the beginning of this post, Ignis' technology is impressive, and may hold the key for lowering the costs of OLED panels, at least in the short term. I'm not the only one that is impressed, and during SID Ignis announced that Frost & Sullivan is presented the 2012 Technology Innovation Award in the global AMOLED display market to Ignis Innovation. Obviously, the real question is whether they'll be able to sign-up partners for this technology, and whether RiTdisplay will actually start to produce these panels.